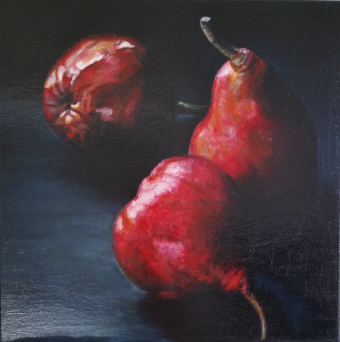 The Fleurieu Food + Wine Art Prize is part of the Fleurieu Art Prize, celebrating the art, food and wine of the Fleurieu Peninsula region with a $10,000, non-acquisitive prize for paintings with a food and wine theme. The judges for the Food + Wine Art Prize are highly respected in the art world and include artist and Associate Professor Lecturer, Drawing at Adelaide Central School of Art, Chris Orchard, Director of Anne & Gordon Samstag Museum of Art, Erica Green and Peter Walker of Peter Walker Fine Art Gallery. 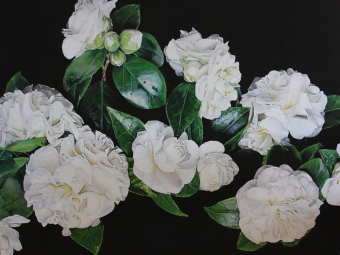 In China, the camellia represents the union between two lovers. The delicately layered petals represent the woman, and the calyx (the green leafy part of the stem that holds the petals together) represents the man who protects her. The two components are joined together, even after death. Typically when the petals of a flower fall off, the calyx will stay intact. With camellias however, the calyx and petals fall away together, which is why the camellia also represents eternal love or long-lasting devotion. One of the symbolic meanings of the peony is “shyness” where a stem of the flower can be translated into “blushing girl”. In French culture, there is even an expression that says, “as red as a peony”. Other lure uses this symbolism to express embarrassment, which is referenced in several poems about nymphs and fairies covering their naked bodies with peony petals from prying eyes. Myth says that it is extremely harmful to your karma to ever remove a rooted peony from your landscaping once it has been planted. Since Ancient Times to the Present Day, we have surrounded the egg with magical and supernatural beliefs. Eggs symbolize birth and new life, and were believed to ensure fertility. They also represent rebirth, and hence long life and even immortality. 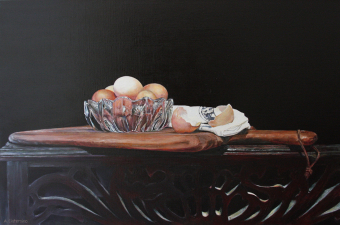 Eggs symbolize life in its different stages of development, encompassing the magic and mystery of creation. Early mythmakers viewed both the sun and the egg as the progenitors of all life; the round, yellow yolk symbolizing the sun. Buffalo, New York was founded on a rich tradition of architectural experimentation. The city contains buildings designed by American architecture masters like Frank Lloyd Wright, Louis Sullivan, and H.H. Richardson, making Buffalo one of the most architecturally significant cities in America. The Pan-American Exposition was held in Buffalo from May 1 to November 2, 1901. 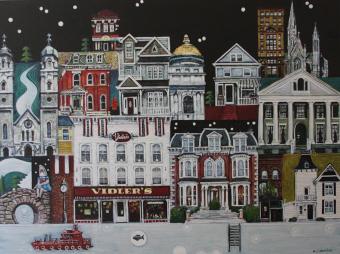 Buffalo was chosen as the location because of its size (at the time it was the eighth largest city in the U.S. with a population of approximately 350,000) and also because of its well suited railway connections. Renown authors F. Scott Fitzgerald and Mark Twain were both residents of Buffalo. 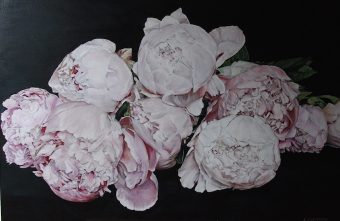 The Sarah Bernhardt peony was introduced in 1906 by the French breeder Monsieur Lemoine and named after Sarah Bernhardt, a French actress who slept in a peony filled coffin as preparation for a role. Considered to be the most famous actress of the late 19th and early 20th centuries, Bernhardt was not just recognized for her intense performances that left her often passing out at the end of each show, but also for her eccentric, flamboyant and scandalous lifestyle. Her international stardom, numerous affairs and entourage of exotic animals, which included a cheetah, a wolf, a boa-constrictor, and an alligator named Ali-Gaga (before it’s untimely death of being fed too much milk and champagne) saw her name appear in one publication after another everyday throughout her 60 year career. In ancient Greek and Roman mythology, the Calla Lily represented the goddess Hera, from whom it was believed the flowers came. The myth is that Zeus brought his mortal son Hercules to his wife Hera to nurse from her as she slept. Zeus wanted his son to have divine powers from drinking Hera’s milk, but because the child was from another woman, Hera flung Hercules away from her when she woke up. Her milk flew out through the universe to create the Milky Way, and a few drops fell to Earth, where beautiful white lilies sprung from the ground. In Roman mythology, Venus, the goddess of love and lust, saw the flowers, and in a fit of jealousy over their beauty, she made them grow a large pistil in their centre. Long a symbol of love and passion, the ancient Greeks and Romans associated roses with Aphrodite and Venus, goddesses of love. Used for hundreds of years to convey messages without words, they also represent confidentiality. In fact, the Latin expression "sub rosa" (literally, "under the rose") means something told in secret, and in ancient Rome, a wild rose was placed on the door to a room where confidential matters were being discussed. 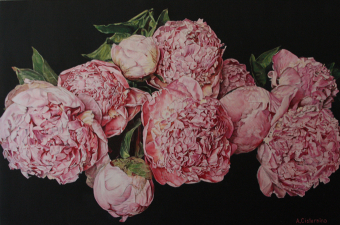 Peonies have been used and cultivated for over 4000 years in China. There are hundreds of cultivars, of which only a few can be found in gardens in Central Europe. 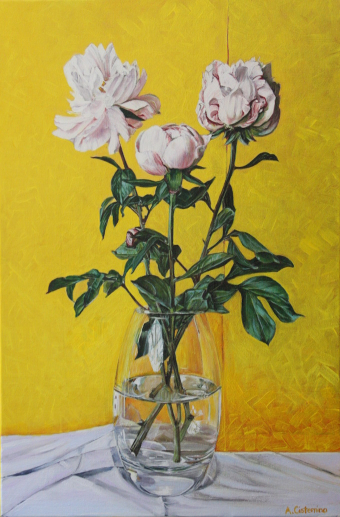 In Europe, herbaceous peonies are a part of ancient Greek mythology and are highly regarded for their medicinal properties. The root, bark, seed and flowers were all believed to have medicinal uses in eastern Asia and Europe. 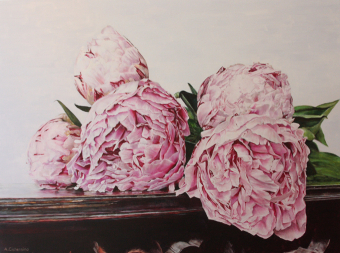 Ancient Greeks and Christians from the Middle Ages believed peonies were a symbol for healing. They were used to treat stomach pains, bladder issues, jaundice and even nightmares. The colour yellow relates to acquired knowledge. It is the colour which resonates with the left or logic side of the brain stimulating our mental faculties and creating mental agility and perception. Being the lightest hue of the spectrum, the colour psychology of yellow is uplifting and illuminating, offering hope, happiness, cheerfulness and fun. In the meaning of colours, yellow inspires original thought and inquisitiveness. Quince (Cydonia Oblonga), one of the oldest fruit on Earth, has powerful historic symbolism, beautiful aroma and therapeutic properties. It was suggested as the 'apple' that Eve gave to Adam in the Garden of Eden. Aphrodite is often depicted holding a quince in her hand as a symbol of love. It is said that trees are vessels, containing strata of revolutionary wisdom, and are a metaphor for spiritual growth. Here the artist has created an organic study of perspective and fluidity through her representation of convoluted sticks. She sets the subject against a Manganese Violet and Iron Oxide Black background, attaining a contrast for the light bathed element. 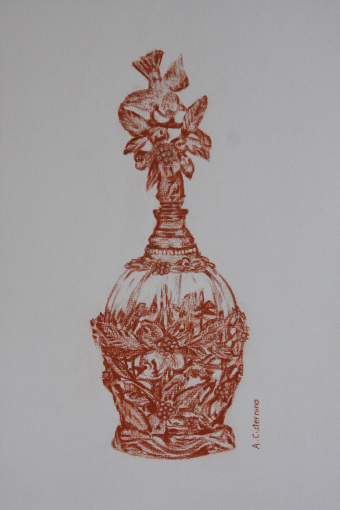 The artist uses thick, jewel-like glazes to reproduce bark-like texture. She establishes a sense of perspective with sharp and soft focal points. With its bold flavours and rich colours, the pomegranate traces back to 3,500 B.C. The countless seeds inside this large, blushed-red berry have rendered the pomegranate symbolic of prosperity, eternal life, wisdom, fertility, and good luck. 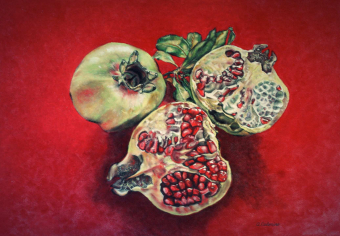 The pastel layering technique evident in this artwork achieves subtle variations of colour that accurately represent the glow and transparency of the pomegranate seed. Because perfume was a precious and costly substance in ancient times, it was typically restricted to the wealthy. Royalty and clergy were most likely to use fragrance, a tendency that continued throughout ancient Egypt, Rome, Greece and elsewhere. In ancient Greece, a person who was too poor to afford perfume might simply have a perfume bottle painted on their coffin, a tribute to the gods. Perfumes and fragrances can be traced most notably to the ancient Egyptian civilization. In fact, Egyptians associated their perfumes with the gods. The fragrances were considered to be the sweat of the sun god, Ra. Given the influences of ancient Egypt on the ancient Roman and Greek civilizations, the use of scents spread throughout the ancient world. Other ancient cultures, such as ancient Iranians and the ancient Chinese, also prized fragrances, though the Chinese used scent in the form of incense instead of perfumes to be worn. Homer, famous author of The Odyessy, called pears “gift of the gods”. 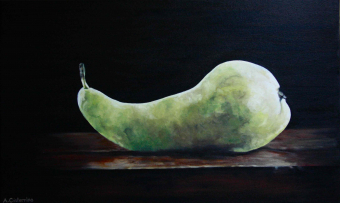 The green conference pear originated in Europe and is a greenish-brown skinned fruit with an elongated bottle. The artist has used oil paints and multiple layers of pigmented glazes to attain a jewel like surface, adding brightness and depth. These ruby coloured pears are a member of the rose family (Rosaceae). They are one of the world’s oldest cultivated and beloved fruits. 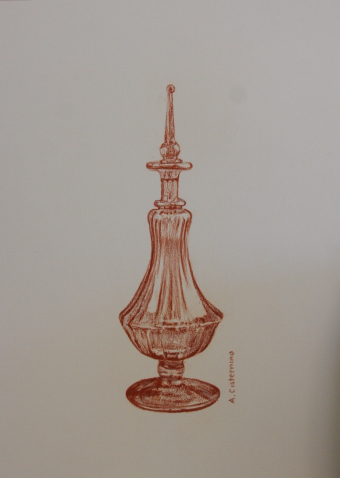 Their bright crimson tones and distinctive form makes them wonderful muses for the artist. The artist has created a textured canvas with a subtle underpainting of ripples. She has used oil paints and multiple layers of pigmented glazes to attain a jewel like surface, bringing out the intense pigments against a Paris Blue and Iron Oxide Black background. Wild fig trees first grew around the Mediterranean Sea, in Africa, West Asia, and South Asia beginning about a hundred million years ago, in the time of the dinosaurs. A symbol of abundance, fertility and sweetness, the fig tree was held sacred in many countries. 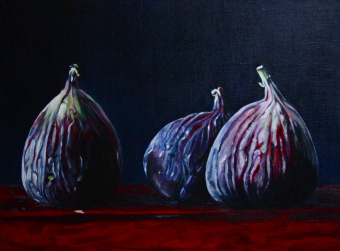 The artist’s impression of this dark purple fruit reflects multiple hues and distinct highlights that contrast with a Paris Blue and Iron Oxide Black background. 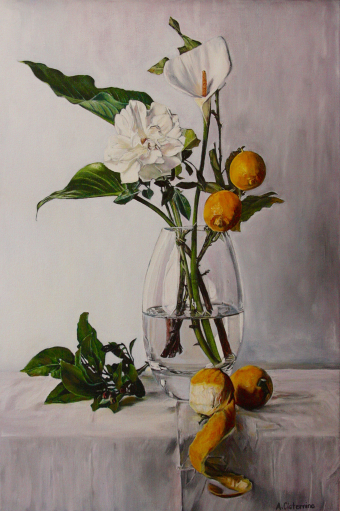 The artist combines wet on wet oil paint, glazing and scumbling techniques to establish a light and shade illusion, while the rough grain of the linen canvas provides an organic texture to the artwork. 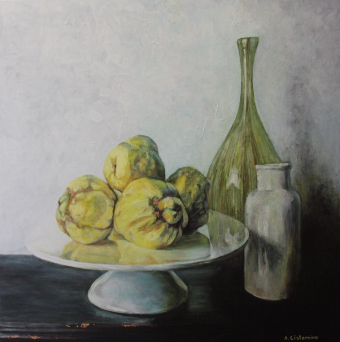 Quinces are thought to be ‘golden apples’ in Greek Mythology. They have been cultivated for thousands of years and ancient civilisations prized them for their taste and fragrance, and also for their poetic form. 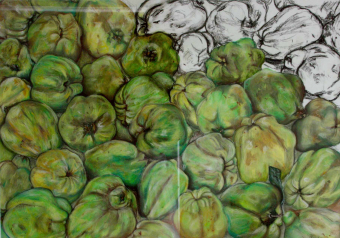 In this representation, the artist interprets each fruit as an individual element. 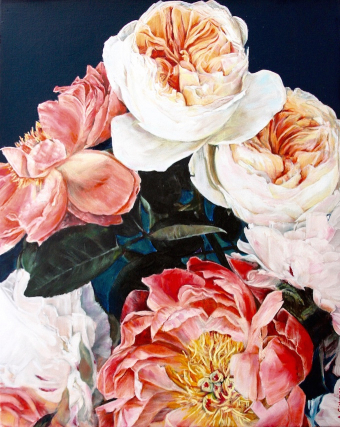 She creates an underdrawing with charcoal and renders them alive with multiple layers of pastel colour pigments, paying special attention to highlight the bulbous protrusions. The partially uncoloured segment provides contrast and perspective to this colourful and animated artwork. 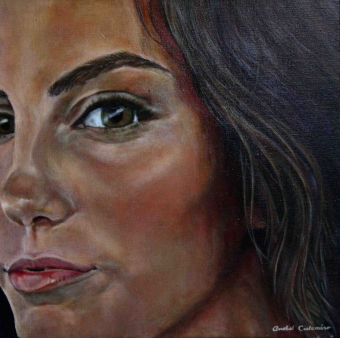 This painting of 18 year-old Azzurra, the artist’s daughter, captures a wistful gaze. 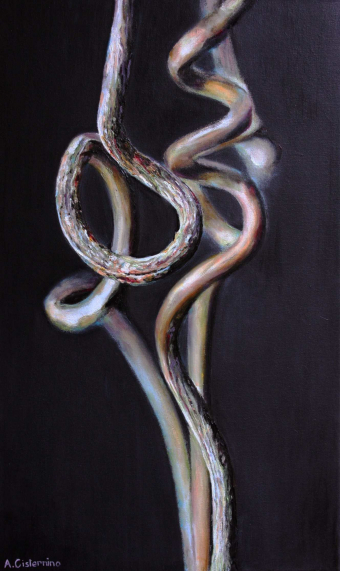 With the eye as a focal point in the artwork, the artist creates a connection to the subject and brings her to life. The rough grained linen canvas provides an organic texture that is then layered with oil paints and multiple layers of glazes to attain brightness and depth.